Hello! Today I am introducing you to a really fun theme that will be brought to you by the wonderful sewpony team...the sewpony sewing series! Every month (usually around the 1st of the month), 2-3 members of the team will be sewing with sewpony patterns along with a monthly theme. This month's theme is 'sewpony hack' - hack meaning to change/chop/alter an existing sewpony pattern to create something new. Today I am showing your two beautiful garments made by Daisy and Mijke, using the Issie top pattern and Juliette pattern. But before I talk more about them, I want to let you know that you can join in on the fun too! I will be sharing my sewpony hack later in the week and over on IG if you would like to join in, you can find out about a cool prize you could win. Simply upload your creation sewing along with the theme and use the hashtag #sewponyhack. At the end of the month, Daisy and Mijke will choose their favourite and so the winner will be chosen. On May 1st, the winner will be announced as well as a new theme and new creations!! I will sew along each month too. This will continue until December 2018. Head over to IG to see more and find out what the April prize is! 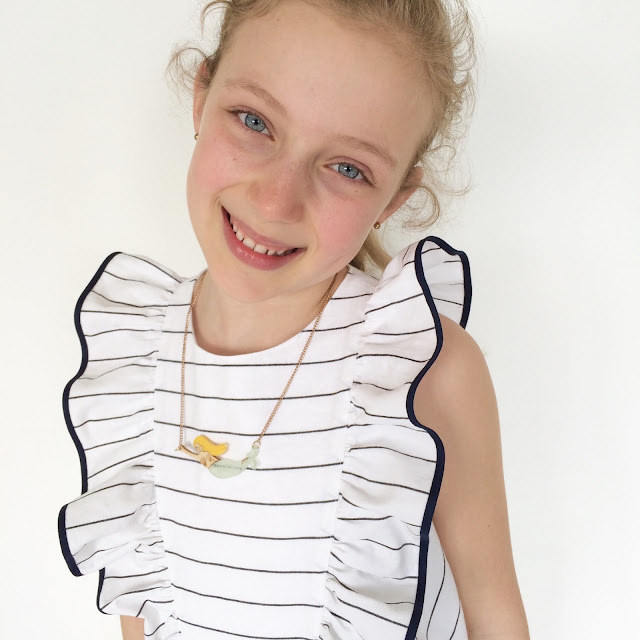 Now, Daisy has made the most stunning striped Issie top hack from woven stripes! It's so pretty and she shares more photos and details over on her blog at Molemieke. Daisy also made the top sleeveless. I love it and Femke looks stunning!! Thank you Daisy! Mijke from Sew it curly has sewn an amazing Juliette dress hack! What an amazing ruffle!! Rose looks equally beautiful and I think Daisy and Mijke were similarly inspired with stripes! Go and see more photos of Rose over at Mijke's IG account! I hope you are excited about the sewpony sewing series and inspired by these wonderful ladies! We would love you to sew along!!! And we can't wait to reveal all the themes each month! It was so much fun to hack the Issie top! Hope there will be a lot of people who are joining the #sewponyhack!